What is so smart about this stylish looking faucet? iHouse Smart Faucet features a face recognition system and turns on the water automatically to the preferred configurations (i.e. temperature, pressure, flow etc) for different individuals. This is very useful if you have multiple inhabitants in your house and saves the hassle of having to remix the water to the desired temperature and flow every time you use it. It even allows for you to check your calendar, access email and so on through a touchscreen interface. My Verdict? 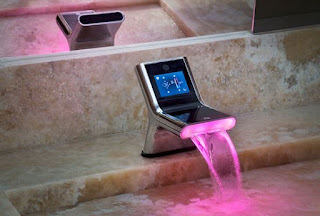 Having automatic water temperature and pressure function allows you to shave off some time from your hectic schedule. However I doubt its email and calendar feature is very useful due to its limited screen size. Furthermore, I am not sure whether if this Smart Faucet is smart enough to premix the water settings according to the different climate seasons. However if it does, it is worth an investment.